Fascinating and funny birds that cannot fly, but can swim, there are 18 species of penguin and the majority of these are threatened by climate change and habitat loss according to Birdlife International. Birdlife works to protect approximately 70 endangered bird species. We will expand on the enormous "other birds" category in the coming months. In the meantime, here is a current list of the world's 100 most unusual and endangered birds as published in the Guardian. Audubon A household name, Audubon has been around since 1905. Birdlife International A UK-based coalition of 120 global partners dedicated to nature conservation. Puerto Rican crested toad, Mississippi gopher frog, Blue spotted salamander, Panamanian golden frog, Kihansi spray toad, Utah Boreal toad...these are just are a few of the fascinating amphibians that are gravely endangered and some exist only in captivity. 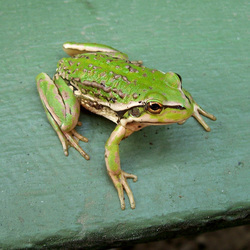 Amphibians are especially sensitive to climate change and pollution. Amphibian Survival Alliance (ASA) A Texas-based coalition with projects around the globe. Bahamas Rock Iguana, Grass-Loving Lizard, Hispaniolan Ground Iguana, Cuban Crocodile, Orlov's Viper, Tenerife Speckled Lizard...the list of endangered reptiles is a long one. Do you know of organizations that are working to save reptiles? Let us know! Endangered Species International Headquartered in San Francisco, this team of scientists and conservation leaders also has offices in Switzerland, The Democratic Republic of Congo and the Phillipines. According to Eric Goode, founder of the Turtle Conservancy, "Out of the 330 species of turtles and tortoises, over half of them are threatened with extinction." Clearly it is a challenge to provide a snapshot of 330 species, but we will expand this section in the coming months. Turtle Conservancy The TC's roots date back to 1974.